The trial of Joseph Lewis and George Andrew "Teek" Brassell finally commenced the last week in June 1877 at the Putnam County House. Previously, officials had attempted to conduct the trial on three separate occasions, but each time the case was continued until the next term. The Court tasked Sheriff Campbell J. Bohannon (PHOTO) with the responsibility of safely escorting the Brassells back and forth between the Nashville and Putnam County Jails. Sheriff Bohannon received permission to pick a posse composed of ten men. 13 June 1876: The Court met and set the trial date for 19 June 1876. 16 June 1876: The Court ruled that due to insufficient time to try the case, the trial would be continued until the next term. The defendants were to be transported back to the Nashville Jail by Sheriff Bohannon and his posse. Dobson Johnson and his father, David Johnson, were required to post bond of $250 as security to insure Johnson's appearance at the October trial. 19 June 1876: Bates' attorneys made a motion for Severance of his case from the Brassell case. The motion was granted. The attorneys, then, made a motion for a Change of Venue from Putnam County to DeKalb County. This motion was also granted. From this point going forward, Bates journey through the legal system was separate and apart from the Brassell brothers. In February 1877, the brothers were again escorted from the Nashville Jail to Putnam County to stand trial. On the 23 February 1877, the court continued the case until the next term of the court. The court cases against the Brassells were finally brought to trial in the summer of 1877. On 15 June 1887, The State vs. Joseph Braswell alias Jo Braswell, George A. Braswell alias Teek Braswellbegan. The preceding week, Teek's trial for the murder of John Allison was conducted at the Circuit Court. Unfortunately the trial transcript did not survive the Putnam County Court House fire in 1899. Therefore, the majority of the trial details is lost to history. The Daily Americanreported that Teek was convicted of Murder in the Second Degree of John Allison and sentenced to serve 20 years in the Tennessee State Penitentiary. On 23 June 1877, the trial of the Brassell Brothers for Murder in the First Degree of Russell M. Allison began in the 5th Circuit Court held at the Putnam County Court House. 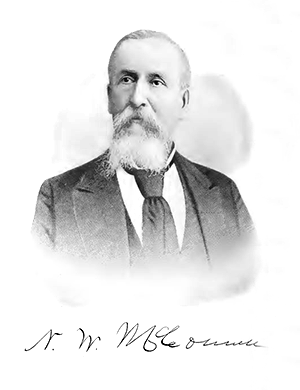 The Honorable Newton Whitfield McConnell (PHOTO) presiding. Attorneys for the State were Attorney General George Hampton Moore, Honorable Columbus Marchbanks, Captain Harvey H. Dillard, (PHOTO) Honorable Burgess Riley Womack, Honorable Alvin Whitten Boyd, and Honorable Holland Denton. The attorneys for the Defense were the Judge Erasmus Lee Garderhire (Wikipedia) (NOTES) and Colonel John Perry Murray (NOTES). The Jurors were sworn in, and the Prosecution began its case on that Monday afternoon. The Prosecution called Dobson Johnson to testify about the events that transpired on the night of the murder of Russ: traveling from DeKalb County to the home of Jim Brassell, plotting to rob Allison/Isbell home, shooting Russell M. Allison, and returning to the Brassell farm. The Prosecution called Angeline Allison Isbell, Joseph C. Allison, Amanda Pippin, and Archibald Bryant to testify about the events that transpired in the house on the night of 29 November 1875. He called Rev. John Lansdon, William L. Ray, Dr. William S. Robinson, Robert L. Gentry and wife Jane Gentry, and Elizabeth Maxwell to testify about what they saw at the Allison/Isbell home on the morning of 1 December 1875 - the day Russ succumbed to his wound. Each testified that they heard Russ's dying declaration that Jo and Teek Brassell were the perpetrators. Dr. William S. Robinson also testified that he was the physician who attended Russ after he was shot. He arrived at the home on the morning of 30 November 1875. The ball had struck Russ near the middle of the hip and came out near the navel. He recognized immediately that the wound was fatal, but he refrained from telling Russ. The Prosecution called the following witnesses who were present at the Still House on the morning of 30 November 1875: W. W. Maxwell, Robert Gentry, Samuel Vaughn, George Jones, and Asa Y. Gibson. They testified about the behavior of the Brassell brothers the morning after the murder. Henry Thompson testified that he heard the gun shots the night of the murder. He met the four men at the forks of the Sparta and Walton Rd. 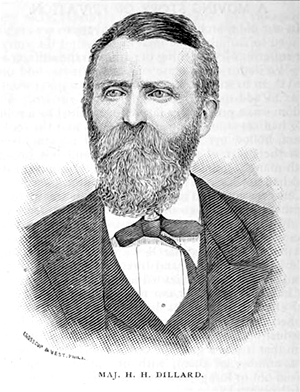 William J. Isbell testified that he was the son of James Isbell and often stayed at the Allison/Isbell home. He was currently the Trustee of Putnam County and was, at the time of the murder, a Tax Collector for the county. He often carried large sums of money as he passed through the section. Bartlett Allison James and William H. Aust, Justices of the Peace for Smith County, testified that Dobson Johnson was a witness in the Curtis case which came to trial on 27 December 1875. At that trial, Johnson was not asked about the murder of Allison. Asa Y. Gibson testified that he was at the defendants still house the night after the murder of Russell Allison. He saw a pistol laying on plank or a puncheon. (DEFINITION) He thought that the pistol was a Beel's patent with three loads in it. He overheard Teek say that he wanted to buy some waterproof caps. J. W. Campbell, who was called by the defense, stated that Johnson had told him that Bates had nothing to do with the killing of Russell Allison. He believed that Johnson's character was bad, and he would not give him credit on his oath. Andrew Jackson Kersey testified that he knew Johnson and that his character was bad. He said that Johnson had told him that Bates was not along the night of the murder. Thomas B. Askew testified that he lived 1.5 miles from Johnson. He believed that his character was now good, and he would give him credit on oath. He, also, testified that Johnson revealed his participation in the Allison murder on the day of the Curtis trial but not at the trial itself. John Wiloby, W. Preston, Charles Williams, John Washer, James Foutch and B. V. Oakley each testified that they lived a mile or less from Johnson. They believed that his character was now good and would give him credit on oath. 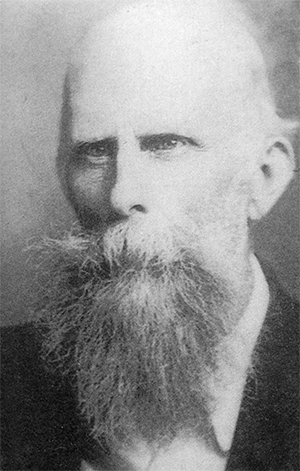 Upon Cross Examination, Thomas B. Askew and the other witnesses, who said that they believed Johnson was entitled to credit on oath, admitted that they heard he had stolen bacon and hogs. Two or three of them admitted that they heard that he had been guilty of perjury, had robbed a store, and had assisted at the Allison murder. However, two or three years had passed since they had heard of him committing a felony. An Alibi Defense where family members testified that the defendants were home the night of the murder. Amanda Brassell and Mary L. Brassell were alibi witnesses for Jo Brassell, and Harriet Z. Brassell was the alibi witness for Teek Brassell. An attempt to discredit the State's primary witness - Dobson Johnson. Amanda Brassell testified that she was the sister of the defendants. She lived about 1.5 miles from the Allison/Isbell house and 1.5 miles from Jim Brassell's house. On the night of the murder of Russell Allison, she was home with her parents. She was suffering from a toothache or neuralgia (DEFINITION) and was awake most of the night with the pain. Later on, Dr. Patton (her brother-in-law) extracted her tooth. She, Jo, and her parents all slept in the same room that night. Her parents slept in the only bed in the room. She slept on a lounge, because she was restless during the night. About two or three hours after dark, Jo came in and said that he had gotten his feet wet at the mill. Since he wanted to sleep with his feet near the fire, he brought in a feather bed from one of the other rooms and placed it on the floor in front of the fire. He laid down on it and slept there the rest of the night. Upon cross-examination, she stated that Jim and Harriet Brassell had spent the night at their house the night before. The couple slept in the other room with Jo and Teek. The couple slept in one bed, and Jo and Teek slept in the other. Buck Brassell was not staying at the home that night. She remembers the night of the murder as being a clear, starlit night. The next morning, a frost had covered the ground. Even though there was no lamp or candle in the room, she knows that Jo was present all night long, because she was the one who tended the fire all night and had to get up to put wood on it. Mary L. Brassell testified that she was the mother of the defendants. She said that since her husband worked that day and was tired, he had retired to bed early that night. She went to bed shortly afterwards. She corroborated Amanda's story about Jo getting his feet wet, placing the feather bed in front of the fire, and sleeping on it. Because Amanda had kept her awake most of the night with her constant activity, she knew that Jo had been in that room all night. Under cross examination, she stated that she could not remember who took the feather bed back the next morning. She could see that the night was a cold starlight night, because the window had no curtains. She saw a heavy frost on the ground the next morning. Amanda had a petroleum lamp in the room which she lit for part of the night. She does not know for how long the lamp burned. She thought that Buck Brassell stayed there the night before as she heard Amanda laughing about Jo and Teek "requiring a consideration for his sleeping with them." Harriet Z. Brassell testified that she was the sister-in-law to the defendants. She had married their brother, James Brassell, three years ago on the 3rd day of March. On the night of the murder, she was home with her infant son. Her husband had gone to Noah Deering's farm earlier in the evening and did not return until an hour or two after dark. Before Jim came home, Jo and Teek came to her house. Teek was clearly drunk, and Jo had been drinking. Jo stayed about 25-30 minutes before he left. Teek went to bed. He pulled off one of his boots but was unable to remove the other. He asked Harriet for help, and she pulled off the other boot. When Jim came home, the couple retired for the night. Around 11pm, Teek groaned. Jim got up, asked him if he was cold, and covered him with a blanket. Harriet knew that Teek was there all night, because she was awake most of the night tending to her 8 month old son who was sick with the croup. Sometime between midnight and day break, two men arrived on horses and requested food for themselves and for their horses. They wanted to leave before daybreak. Jim told the men that he had no barn, but they could turn the horses loose in the front yard and they would be fed. They asked if they could hitch the horses over in the back field and fed them there. Jim replied that if they wanted to hide their horses, then he did not want them or the horses on his property. They then left. At this point, the Defense attorney asked if the men gave their names. The State objected to the question, she was not allowed to answer. The defendants excepted, the objection was withdrawn. Harriet replied that one said his name was "Anderson" and the other "Bates". Samuel G. Brassell, alias Buck Brassell, testified that on the morning after the murder, he saw two men between James Brassell's home and the mill - near the Bradford house. Although he knew Dol Bates and had seen him a couple of times before, he did not know the other man, who called himself "Anderson". He later found out that the unknown man was actually Dobson Johnson. The men said that they had been over on the creek near Elmore's and had gotten lost. They requested directions to the Still House. Buck told them that if they went down the hollow, they would not miss the trail. He testified that Jo and Teek had eaten supper the night before at William Brassell's. They had also eaten breakfast the next morning there, as well. Other witnesses testified as follows. William H. Aust and Bartlett A. James, Justices of the Peace for Smith County, testified that they were JPs in December 1875 when Johnson was brought before them on a charge of larceny. On 27 December 1875 (the start of the Curtis trial), he confessed that he was present when Allison was murdered. They did not ask him any details, but he just volunteered the information. Attorney General George H. Morgan testified that after Johnson came forward on the day of the Curtis Trial and admitted participating in the Allison murder, he had not made any statements about money in a clock. Johnson was only asked about the murder of Allison and not about the details of the night. Johnson was not given any promise of a pardon. William Bennett testified that he once lived close to Johnson, but he now lived 17-18 miles from him. He said that Johnson's character was bad, and he would not give him full faith and credit in a Court of Justice. J ames Jones testified that a year earlier (about 1876) when he traveled with Johnson to Spring Valley, they had a conversation where Johnson said that the conspirators had eaten supper at the Still house the night of the murder. Another time while he was at William J. Isbell's home, he heard Johnson tell Angeline Isbell that the murder happened in a different way or by a different person. Noah Deering testified that James Brassell and his brother, Zack, came to his house during the early evening hours on the night of the murder to discuss a debt owed to him. Deering owed Jim $10, and Brassell wanted to know if he could have some corn for the debt. The Brassells stayed about a half hour and then headed towards their home. He testified that John Sliger's character was good, and he would give him full faith and credit in a Court of Justice. On Cross Examination, he admitted that he was aware that John Sliger was indicted for counterfeiting. Leroy Holloman testified that on night of the murder, he was staying the night at Captain McDearman's house. While traveling from Tracy City and passing through Rock Island, he arrived at Woodfork Maxwell's about "dusky dark." Upon getting closer to the house, he spotted three men sitting on a woodpile. One of the men, whom he later identified as resembling Johnson, walked over to him. Holloman asked the man for directions to Allison's place, and he gave him directions which he found to be correct. Benjamin Halliburton was with him at this time. Halliburton confirmed everything Holloman said, except he did not see the man who requested directions. He was seated the back of the wagon and could not see him. John W. Sliger testified that he saw Johnson at Woodfork Maxwell's on the evening of the murder. He saw two or three men in the yard. One of the men was a man by the name of "Silcox" who had since left the county. On cross-examination, he admitted that he was indicted for counterfeiting in Federal Court. He also testified that he saw Bates and Johnson on the road by the Allison's on the night of the murder. J. M. Lee testified that approximately a week after the murder, he went to James Brassell's for dinner. On the way there, W. W. Maxwell got into the wagon in which he was traveling. Maxwell commented that Jo and Teek would hang because Johnson was turning States Evidence. Later that evening during dinner with the Brassells, the murder was discussed; but he could not remember if Harriet Brassell said anything about it. Another time while in Cookeville, James Brassell had told him that Johnson was about to turn States Evidence. Maxwell had said something about Johnson confessing. Joseph Bullington testified that he and J. M. Lee were having supper at James Brassell's about a week after the murder. Harriet Brassell said that Johnson, Bates, Teek and Jo had dinner at her house the night of the murder. Shortly after dark, she made supper for the men. Then Teek and the two men went off while Jo stayed the night. Upon cross-examination, Bullington testified that he was driving the wagon that Lee was riding in. Prosecutor W. W. Maxwell approached them and asked if he could ride with them. Maxwell was talking to Lee about the murder when he said something about Johnson turning States Evidence and the Brassells being hung. They ate supper at Jim Brassell's house that night. Columbus Marchbanks testified that the mashed ball (bullet) was the one that killed Russell Allison. He believed that it was the same size ball used by a pistol such as a Beel's patent would use. Asa Y. Gibson testified that he thought that a Beel's pistol was the size of Colt's army pistol, but that he was not familiar with pistols. Dr. Campbell testified that he met Johnson not long after his confession to being present at the murder. Campbell asked Johnson what Bates had to do with the murder, and he replied that Bates had nothing to do with it. Johnson's character was not good, and he would not give him full credit in a Court of Justice. Andrew Jackson Kersey testified that he overheard the conversation with Dr. Campbell and heard Johnson say Bates did not do the killing. Johnson's character is bad and he would not give him full faith and credit in a court of law. Character witnesses for Angeline Isbell, Joseph Allison and Amanda Pippin testified that all were of good character and entitled to full credit. Character witnesses for John Sliger testified that his character was bad. Character witnesses for Buck Brassell testified that his character was bad. Testimony began on Monday afternoon, 25 June 1877, and concluded Friday morning, 29 June 1877. Judge McConnell sent the case to the jury at 12 o'clock Friday. Early Saturday morning, the jury delivered the verdict of Guilty of Murder in the First Degree. Judge McConnell said "You will both please stand up. Mr. Joseph Braswell, the jury has found you guilty of murder of Russell Allison, as charged in the indictment. Have you anything to say why the sentence of death should not be pronounced upon you?" There was no reply from Jo. The same question was asked of Teek. To which he sternly answered "Yes, I'm not guilty." "This is the most solemn spectacle that can be presented in a court of justice. It was written long ago, by the hand of God himself upon the table of stone, 'Thou shalt not kill,' and it was also written thought the great Law giver of Israel that 'whoso sheddeth man's blood by man shall his blood be shed," and the law of Tennessee says, 'every person convicted of the crime of murder in the first degree, or as accessory before the fact to such crime, shall suffer death by hanging.' You have had a fair and exhaustive trial. You have been zealously defended by the most able and experienced attorney's that the country affords. You have had the benefit of every rule of law applicable to the facts of your case. You have been convicted by an honest jury of your peers, selected under the laws and constitution of the State. Their verdict of murder as charged in the indictment, the Court thinks, is fully sustained by the law and evidence, and that there can be no reasonable doubt but that you did, on the night of the 29th November 1875, murder Russell Allison in the county of Putnam. Having thus violated the law, that has not only the sanction of the people of the State expressed through their Constitution and laws, but also the direct sanction of Almighty God Himself, you have forfeited your lives to the people. The Court and jury and Sheriff are but humble instruments to execute the commands of the law, made in obedience to the will of the whole people of the State. It is a solemn thing to die when nature yields to the inroads of disease or decrepitude and age, or when some sudden calamity overtakes us; but it is a more solemn thing to die at the hands of the public officer under the judicial sentence of a court of Justice. As tears flowed freely in the courtroom, Jo and Teek stood stoically during sentencing. A short time before Christmas (NOTES), Egbert H. Brassell, the father of the boys, sent them a gallon of bitters. (DEFINITION) Each day, the jailer dispensed a half pint of the liquid to Jo and Teek. Instead of drinking their rations, they hid it in their cell. They hatched a plan to escape on Christmas Day and needed liquid courage to put their plan into motion. On Christmas day, the jailer normally expected a steady stream of visitors to all the prisoners in the jail. To make it easier on staff and visitors, he decided to allow the prisoners to leave their cells and stand at the curtain bars while visiting with their company. Every prisoner was allowed this special treat -- except for the Brassells, who were to remain in confinement. The Brassells assumed that Jailer Yarbrough would leave for the day and that the only other deputies on duty would be Jo R. McCann and Green Morrow. They plotted with their cell mates in Cell #3 and those prisoners in Cells #4 and #6 to grab Deputy Morrow through the curtain bars and hold him. While he was immobilized, the Brassells would break through the curtain door, rush McCann and make their escape. On Christmas Eve, the Brassells quietly sawed through the chain on the inner door of their cell. Since they knew that the outer door would be left unlocked, all they had to do was to step out in front of the curtain. On Christmas day, one of the prisoners called out to McCann, who then went in to check on him. As he opened the door, he heard the chain from the Brassell's cell hit the floor. The brothers walked out of their cell - bold and defiant. McCann cried out to Morrow, who immediately rushed in. As he entered, the Brassells asked him to shake hands. He refused. The brothers were subdued and returned to their cell - escape plan foiled. As punishment for this escape attempt, Jailer Yarbrough placed the brothers in 23 pound ankle shackles. Teek, who was determined to break them, succeeded after a very patient and tedious struggle. He used one of the chain links to pry the shackles back and forth. Then he used the bottom of iron bars on his cell door as a vice. To carry out his task, Teek laid down on the floor on his back. Then he would flop on his face. Each turn caused a twist on the shackles. He was SOintent on freeing himself that he continuously twisted back and forth for nearly twenty-four hours. In another escape attempt the day after Christmas, Teek trapped himself under the inner door of Cell #1 and had to be freed by the deputies. The space between the floor and the bottom of the door was only 4.5 inches, and rods from the door protruded out .5 inches. Teek, somehow, managed to get his head and a portion of his body through this tiny space. When he was finally discovered, the deputies had a difficult time extricating him from under the bars. His head and shoulders were badly bruised by the rods. Upon being freed from his predicament, he tossed the shackles to one of the deputies telling him to present them to Jailer Yarbrough - with his compliments! The Tennessee Supreme Court addressed each point in great detail in the opinion. Chief Justice Sneed concluded with "Upon the whole case, we are satisfied that these defendants have had a fair and impartial trial; that the proof demonstrates their guilt beyond a doubt; that they have forfeited their lives to the violated law, and the judgment must be affirmed." Then Chief Justice Sneed asked the prisoners if they had anything to say. Joe: "I am an innocent man; I will have to suffer what some one else has done." Teek: "The witnesses against me have sworn positive lives, for the purpose of taking my life. I am able to show it, but am too excited now; I will have it written out by someone who understand how to fix up such thing and send it to the Court." Sneed: (interrupting him) "If you can make these matters plain to the Governor, there might be some hope for you yet." Teek: "The evidence of Mrs. Isbel and Johnson varied; Johnson was there, and he turned State's evidence against us; in his evidence he said four railroad men came to the house and asked for supper; Allison himself swore falsely against me; it was all done through malice, for the purpose of taking my life, and they have accomplished what they aimed to do; this is all I have to say at present." With the opinion of the court read, both doomed men held up well. When they began to realize the gravity of their situation, tears trickled down Jo's cheeks. On leaving the courtroom they said "All we want on this earth is to have a chance to kill the three God damned rascals that swore lies on us, and then the law can hang us as much as it please. Excuse us for swearing in your present, though a man can't help but get mad and swear about a thing like this." Upon returning to the jail, the defendants told the other prisoners of their death sentences. They concluded by saying "but we guess we won't hang."